Who said you are too old for sport bike? I'm 46 hadn't ridden really since I was 12. I'm re-familiarizing myself with motorcycle again in 2008, when I talked my youngest son (20 years old) to take a MSF course with me and get our motorcycle license. I am 5 foot 3, so I decided to buy a 2009 Ninja 250 and rode it for two months and got bored of it. So I bought a 2008 Honda CBR600RR and have put over 12,000 miles on her within a year. I rode my bike almost daily, just love to ride and wish I've gotten back sooner. My love for speed and fun make me want to get a Hayabusa. But then I know I will get myself in a lot of trouble so I am thinking about a cruiser, Victory Vegas. I tested ride the bike at River Run and think this will be a best bike for hot rod NaNa, plus my boyfriend will be able to catch up with me then, since he's ride a HD. Last summer we rode 500 miles straight through to see my mom. It was a great ride and I just wanted to keep going. You are never too old to enjoy yourself. 39 and a Nana Also! I just got my license three weeks ago,and I bought a Kawasaki ZZR600. I love it except I have problems with my take off...But once I do, I love the speed! I can't wait to get where u are including the pony tails! I am 43 and also a petite lady at 5'2". I just finished my course a few weeks ago and for my birthday my hubby and son gave me a '10 Ninja 250. So far I have enjoyed learning to ride it and once I get more comfortable with it, I look forward to moving up. Keep us posted on how your doing and how you like your new bike. 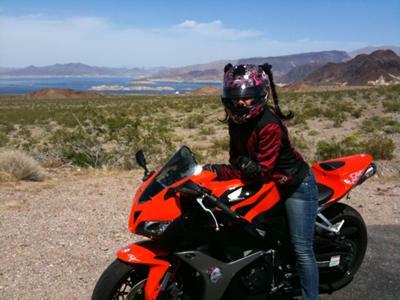 I know a couple of other Lady Riders with the same bike and they LOVE theirs too! Oh and I am digging your ponytails. I have blue ones! My husband thinks I'm crazy! But my son digs them. He wears a red mowhawk...lol! I am a Nana and I ride to too! Stay safe and have fun! NaNa-love your bike! and you're right, you're not to old for a sport bike. I'm a teeny bit older than you and I have a Ducati Monster. It's so much fun! I ride with a group of kids (kids to me!) and their sport bikes, it still amazes me that they want to ride and hang out with someone who's old enough to be their Mom! But it's tons of fun. My fiance has a BMW cruiser and can't keep up with me. So I get my need for speed with the kids, nothing to crazy though. If you buy a cruiser, keep the CBR! BTW, I love the helmet hair pigtails, did you get them from The Wicked Diva?